It is Grey's Interrogation. 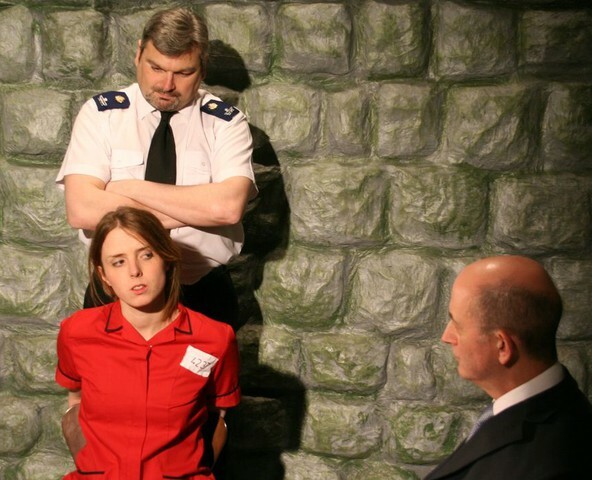 Caroline Grey - Prisoner 4237 is not sitting comfortably on a chair. She's sitting bolt upright, with her wrists handcuffed together behind her back. Both Warden Lewis and the Governor of the prison have joined forces in an effort to make her spill the beans about the Internet banking fraud that she's involved in. But she either doesn't answer their questions or her answer is - 'I don't know.' As she sits in the chair, Officer Lewis places one hand on the back of her neck and the other hand on the front of her neck, under her chin - forcing her head up and looking at him.He then puts his face down and shouts at her - she shudders because his breath smells foul. But all Officer Lewis is trying to do is teach her manners. It's common courtesy to answer when the Governor asks a question. It's obvious the line of questioning they are using is a waste of time, so the Governor suggests to Officer Lewis that they stretch her a bit. So she is standing now with her wrists fastened to a pulley above her head. She is pulled up so that she is on tiptoe. Her arms are taking the strain.As questioning her is not working - the Governor has a paddle and uses it on her bottom. But when questioned again, her answer is always 'I don't know.' The Governor speaks softly to her and gently pushes a wisp of hair out of her eyes. Then he smoothes out her top that has loosened - so revealing some of her feminine charms. But even that doesn't work. So losing patience he tugs her knickers down to her knees - as he does so she suggests that - that is his favourite part. He doesn't like being thought of as a pervert so he spanks her even harder.However, so far Grey's Interrogation is not going too well. So it is mutually agreed between the Governor and Officer Lewis, that a spell in solitary confinement might loosen her tongue. Officer Lewis leads her away. However, so far Grey's Interrogation is not going too well. So it is mutually agreed between the Governor and Officer Lewis, that a spell in solitary confinement might loosen her tongue. Officer Lewis leads her away.